Today is the 60th anniversary of Minnie Minoso’s first game with the White Sox. He was a dynamic player for so many years that it is an absolute shame that he is not in the Hall of Fame. The committee had a great opportunity to put both Minnie and Buck O’Neil into the Hall a few years ago, but for some reason they decided not to. Minnie will probably not get into the Hall of Fame. He was my fathers favorite players as he was growing up. He was also the first black player to play for the White Sox. His color may have cost him the 1951 rookie of the year to the Yankees Gil McDougald. My father still has the clipping comparing the two players. The only category that Minnie was not the leader in was home runs. Other than that Minnie had a much better season. The Sporting News gave Minnie their rookie award, but the writers did not. Minnie may have been the third best left fielder in the Majors during the 50’s. The only players better were Ted Williams and Stan Musial. He was the first Hispanic player of color to play in the majors. His groundbreaking career should have been rewarded with a plaque in Cooperstown. Sadly it probably never will be. They have had ample time to see what he has done, yet he is still ignored. The picture on this card was taken at the Cell in left where Minnie has his statue. It was the first player statue the team attempted, and I still think that for some reason it looks a little off. I wish that they could have come up with a better pose for him. He just looks awkward for some reason. This entry was posted on May 1, 2011 by Pinola Photo. 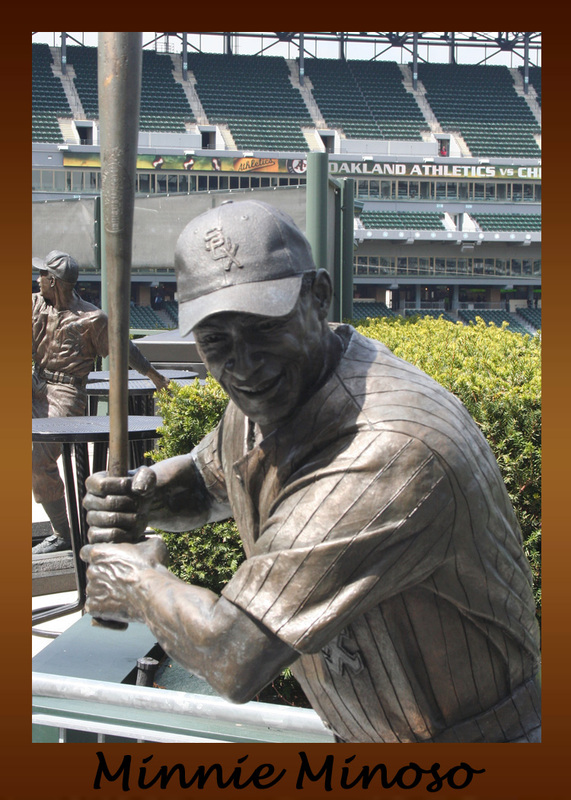 It was filed under 2011 Bronzed Heroes, Chicago White Sox, Minnie Minoso, OF and was tagged with Baseball, Chicago White Sox, Minnie Minoso.